Older people who don’t sleep deeply have changes in the brain typical of Alzheimer’s disease, according to a new study. The findings add to a growing body of evidence linking poor sleep to brain health. People with Alzheimer’s disease tend to sleep poorly. They typically wake up tired, and their nights become even less refreshing as memory loss and other symptoms worsen. This study looked at older men and women who did not have Alzheimer’s disease or other forms of dementia. Most had normal thinking and memory skills, though some had mild memory problems. The researchers, from Washington University School of Medicine in St. Louis, found that older people who have less slow-wave sleep, the deep sleep you need to consolidate memories and wake up feeling refreshed, have higher levels of the toxic brain protein tau. Elevated tau is a sign of Alzheimer’s disease and has been linked to brain damage and cognitive decline. 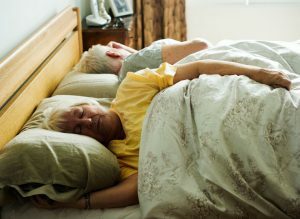 The findings, published in Science Translational Medicine, suggest that poor-quality sleep in later life could be an early sign of deteriorating brain health. Researchers are increasingly recognizing that Alzheimer’s disease take years, even decades to develop. A toxic protein called beta-amyloid accumulates in the brain up to 20 years before the onset of full-blown Alzheimer’s disease. Tangles of tau appear later, followed by damage to key brain areas. Only then do people start showing memory loss and other unmistakable symptoms. For the current study, researchers studied 119 people aged 60 and older who did not have Alzheimer’s disease. The researchers monitored their sleep at home over the course of a normal week, using a portable EEG monitor that measured their brain waves as they slept, as well as a wristwatch-like sensor that tracks body movement. They also kept sleep logs, in which they made notes of both nighttime sleep sessions and daytime napping. The researchers also used brain scans and spinal taps to measure levels of beta-amyloid and tau in the brain and in the cerebrospinal fluid (CSF) that bathes the brain and spinal cord. The researchers found that decreased slow-wave sleep was associated with higher levels of tau in the brain and cerebrospinal fluid. “If someone’s sleep habits start changing, that could be a sign for doctors to take a closer look at what might be going on in their brains,” Dr. Lucey added. Other studies have found that lack of sleep or waking up several times during the night may be bad for the brain and may increase the risk of Alzheimer’s disease. Older men and women who report being very sleepy during the day were nearly three times more likely than those who were not sleepy to have brain changes typical of Alzheimer’s disease. Earlier studies have also shown that poor sleep can lead to memory and thinking problems, even in healthy people. People with a common breathing disorder called sleep apnea, which causes sleepers to awaken briefly hundreds of times during the night, has also been linked to memory problems and an increased risk of dementia. Sleep may serve a “housecleaning” function, some research suggests, helping to clear the brain and spinal fluid of toxic proteins during the night. But poor sleep, as well as sleep apnea, is a common problem in the elderly. Just because you don’t sleep well doesn’t mean you will get Alzheimer’s disease. A sound night’s sleep, though, may be a critical component of a healthy lifestyle — and might even help to keep Alzheimer’s at bay.